I love DIY projects and I love fashion so making DIY fashion accessories is an appealing combination for me! I saw Tanya Memme share how to how to make a Hand Painted Scarf on an episode of Home & Family, which airs weekdays at 10 am ET/PT on Hallmark Channel. It is such a fun creative diy project that you can then put to use by wearing your own one of kind fashion accessory or you can also use your hand painted scarf as a diy gift! So I obtained permission to share her tutorial on how to make a hand painted scarf with you here. You are going to love how easy it is to make these DIY fashion accessories. You just need a few supplies and as much or as little artisitic ability as you have. 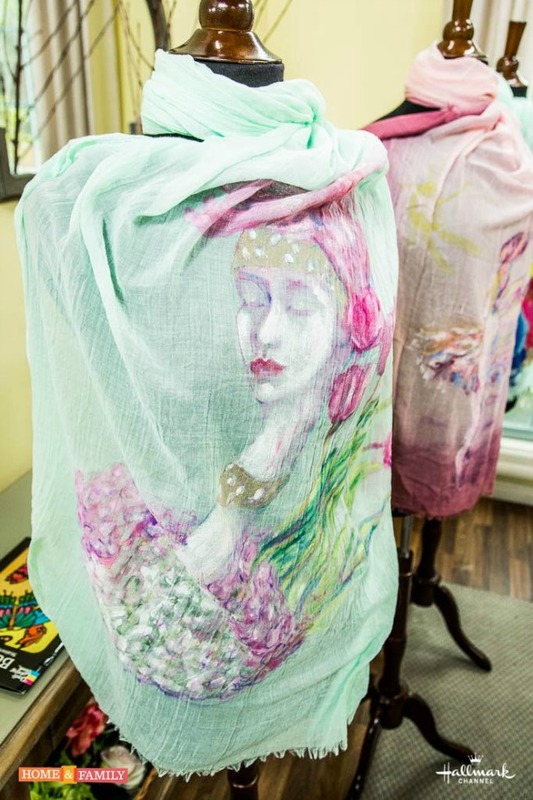 You can free hand your hand painted scarf or you can use an image to trace your design. Cover the cardboard in freezer paper with the shiny side up and tape to secure in place. Optional: Tape a design for tracing to the board. Lay one end of the scarf on to the cardboard and clamp into place. Make sure the scarf is as flat as possible and the freezer paper is secure underneath and clamp on all sides to hold it firmly in place. Draw the outline or skeleton of the design with fabric pens. There will be some bleeding with the fabric pens but don’t panic it will look pretty to have less defined lines. You can stop there or you can fill it in with paint. Make a palette with your chosen colors. Water down the fabric paints a tiny bit by dipping the brush into the water first then dipping the brush in a bit of paint. Fill in design with fabric paint. Either free flow or fill in traced design. Let dry. You can use the fabric pens to color it in if you prefer. Put in dryer for 15-30 minutes on high heat to seal the fabric pen and paint. It is then ready to be worn and will be safe to wash as well. I hope you enjoy this fun project for making DIY fashion accessories. Do you think you will try making a hand painted scarf yourself? Hallmark Channel’s Daytime Emmy® nominated series “Home & Family” in partnership with DreamJobbing announces a nationwide talent search to find the next DIY star to join the on-air team. One lucky winner will be chosen to become a DIY expert on Home & Family for one week in mid-April, joining co-hosts Mark Steines and Cristina Ferrare as the newest creative Family Member. Video applications will be accepted from March 7–April 15, 2016. Submission details and additional information can be found at: http://dreamjobbing.com/homeandfamily.